THIS IS A ROCK CONCERT! I first “discovered” American Bombshell back in March when I came across their video for No Regrets. I was a fan from the first view! There was a raw energy, which seems to be lacking from a lot of the new rock music these days. Anyway, when I saw they were going to be performing at a club in Green Bay (a four hour drive across Wisconsin for me), I bought a ticket right away (back in June). 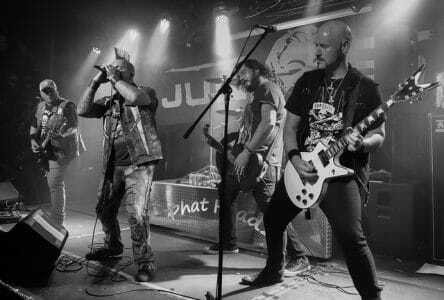 The fact Junkyard was headlining was an added bonus. 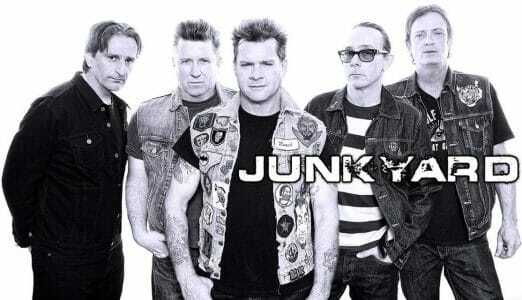 I was a fan of Junkyard back in the late ’80s/early ’90s but never really followed them after their first two albums. We arrived at Phat Headz at 6:00 pm. The tickets said the show had a 7:00 pm start time, but apparently that was when the doors opened. The guys from American Bombshell were hanging around out front, and we walked over to meet them. I must say, they were a great bunch of guys. They took pictures with us and chatted with us while Junkyard sound checked inside. Bassist, Dusty Green, mentioned they hope to have their follow-up to No Regrets out sometime next spring. After grabbing dinner, we returned once the doors opened. We had a chance to me Junkyard‘s singer David Roach before the show started. He seemed almost shy in person but was talking and taking pictures with lots of fans. Both bands were in Green Bay on a day off between performances in Joliet, Illinois for the Rock N Skull Festival. 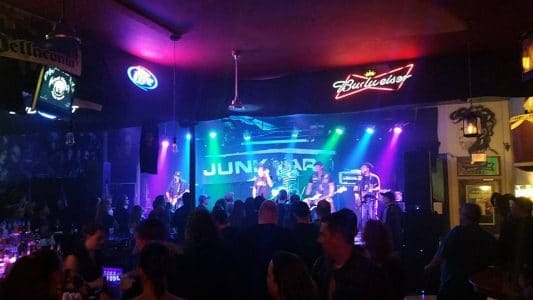 There were a couple of guys at the show who had flown to Joliet for the festival from Arkansas, rented a car to drive up to Green Bay for the Saturday show, and were driving back to Joliet for Sunday’s Rock N Skull Festival. Dedication! We spent a few hours enjoying Phat Headz‘s atmosphere — the paintings of music artists on the walls alone are worth a visit. Eventually, a little before 10pm, American Bombshell took the stage…and owned it. From the opening licks of “Tattooz ‘N’ Booze,” this band was there to rock! The rhythm section of Green (bass) and Jason Carr (drums and cowbell) kept things rolling as Steve Boyles and Andrew Nixon traded licks on guitar. Through it all, singer Jay Cee growled and sang in his uniquely sleazy style and had a crowd that (unlike myself) had never heard of his band yet was singing along with many of the songs. Their set included two new songs — “Saving Me” and “My Drug” — which should be on their follow-up release. They rolled through six more songs off their debut and the crowd was really into them. This is one band that obviously loves what they do and was very appreciative of a great crowd. Uploaded by Tim Vogel on 2016-11-04. Following about a 45 minute set from the Bombshell guys, there was only about a 15 minute break before Junkyard took the stage. 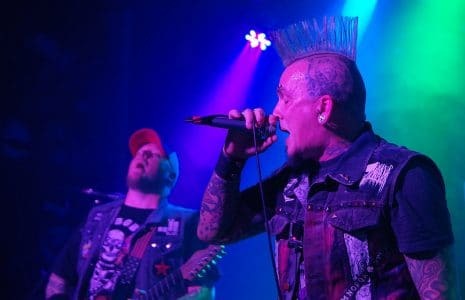 They kicked things off with long time set opener “Life Sentence.” Their set was heavy on songs from their self-titled debut with a few songs of their second disc, Sixes, Sevens & Nines. David Roach had the crowd singing along on favorites, “Blooze,” “Simple Man” and “Hollywood.” He nailed the “talking” part of “Hands Off” and the crowd ate it up. Junkyard played for a little over an hour, and when they left the stage, the crowd was wanting more. From American Bombshell‘s opening notes through the final notes of the Rose Tattoo cover “Nice Boys” that Junkyard closed their set with, this was a ROCK concert. No frills. Great music. Great crowd. Unfortunately, I had a new camera, changed some settings, and my Junkyard pictures didn’t turn out good enough for publication [Editor’s note: I found one from American Bombshell‘s Facebook page]. I must also say that Phat Headz is an awesome place to see a show. It’s small and intimate (the front of bar is literally just a few feet from the front of the stage), and the bartenders were great. The crowd was too. I will definitely return. Uploaded by Tim Vogel on 2016-11-05.